Package of 3 - US$ 3.00 ea. Bag of 12 - US$ 12.00 ea. (Both ship as one item - Up to 3 dozen ships as one item. )OUT OF STOCK - Tempoary - Call if you need some fast. Shipping cost on large international orders of Humanatones will depend on quantity ordered and deliverable country. A snippet of "New Progression for Nose Flute"
Nose flute by Trophy Music. This little gem plays flute tones with mouth controlled pitch. 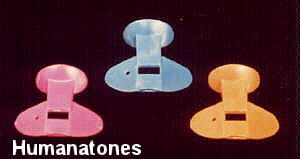 Usually considered a child's toy, Humanatones are capable of great musical expression. Unsurpassed for that loud whistle so often used to express appreciation for a great pair of legs. We sell them in groups of 3 as the quality of each varies a bit, or a bag of 12. A quantity discount is offered for purchases of 144 and over in multiples of 12.